In the 1960s, The 5th Dimension sang, “Would you like to ride in my beautiful balloon?” When Sophie Blanchard’s husband said that to her, she said, “Yes,” and they were Up, Up and Away. Sophie felt most comfortable in the air, but what goes up must come down. Marie Madeleine-Sophie Armant came to the world’s attention when she married Jean-Pierre Blanchard, an inventor and pioneer in French aviation, specifically ballooning. Other than the fact that she was born to Protestant parents in western France, almost nothing is known about her young life. Blanchard was about 16 years old when she married, 35 years younger than her husband, becoming his second wife. She was described as a small, nervous woman who startled easily when she heard loud noises. When she started flying with Jean-Pierre, she felt more at home in the quiet, peaceful sky than on terra firma. TAKING TO THE SKIES Blanchard made her first balloon ascent in 1804 with her husband as a stunt to raise money. Even though Jean-Pierre was the world’s first professional balloonist and had made demonstration tours all over Europe, he wasn’t a very good businessman. They hoped that having a woman in the basket would attract more fans. 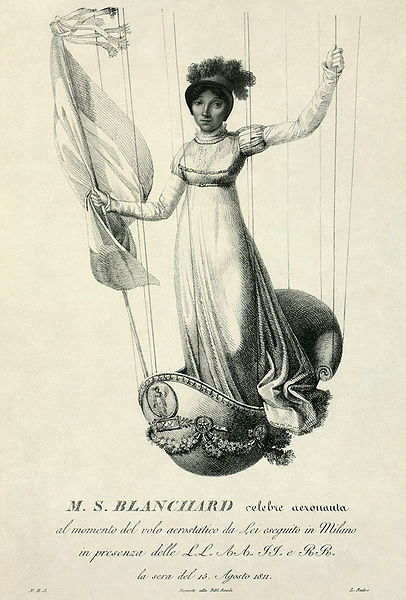 Blanchard wasn’t the first woman to ride in a balloon. Three other women had gone up in tethered balloons, and two women had previously gone up untethered, but seeing a woman aloft was still a novelty. In 1809, Jean-Pierre was flying over The Hague when he had a heart attack and fell from his balloon. He died from his injuries. He had adopted the Latin phrase Sic itur ad astra (“Such is the path to the stars”) as his personal motto. Blanchard decided to follow her husband’s path and became the first woman to fly solo in a balloon. Blanchard still needed to pay off the debt left by her husband, so her balloon of choice was a hydrogen-filled gas balloon. The benefits of using gas (instead of hot air) generally outweighed the risks. She wouldn’t have to tend to a fire to keep the balloon airborne and, since she was a petite woman, she could use a small basket about the size of a chair and minimal gas to inflate the balloon. WORTH THE RISK Even though ballooning had been popular for almost 30 years, the inherent dangers still made it a risky endeavor. 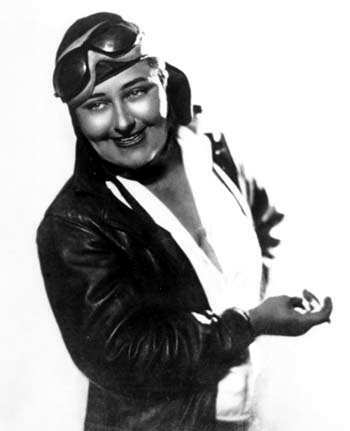 Blanchard passed out during several flights because of the high altitude, and she encountered freezing temperatures when she cruised at 12,000 feet. In 1811, she had to stay airborne for over 14 hours to avoid a hail storm. And sometimes landing was just as risky. One time her balloon made a crash landing in a marsh, and she almost drowned. Blanchard’s husband had experimented with parachutes, dropping dogs out of the basket to demonstrate floating down to earth safely. One time when flying solo his balloon ruptured, and he was grateful for the parachute as his only way to escape. None of Jean-Pierre’s mishaps deterred Blanchard from her own desire to be a pilot. When she had the opportunity to fly solo, Blanchard also tested the flotation devices using dogs, but she never had the occasion to need one herself. When she flew exhibitions at events, she spiced things up by attaching small baskets of fireworks to parachutes to light up the sky as they were falling. GETTING OFFICIAL RECOGNITION Napoleon was a big fan of Madame Blanchard, and he appointed her as the “Aeronaut of the Official Festivals,” making her responsible for organizing balloon demonstrations at official events. In 1810, she flew over the Champs de Mars (today near the Eiffel Tower) in honor of Napoleon’s marriage to Marie-Louise of Austria. To commemorate the birth of their son, Blanchard flew over Paris dropping announcements of the birth. One year later, Blanchard made an ascent over the palace Château de Saint-Cloud during the official celebration of the boy’s baptism, and she set off fireworks from her balloon. There’s speculation that she also devised plans with Napoleon to use hot air balloons for an aerial invasion of England, which were never carried out. Blanchard was also known throughout Europe, and large crowds came to watch her. 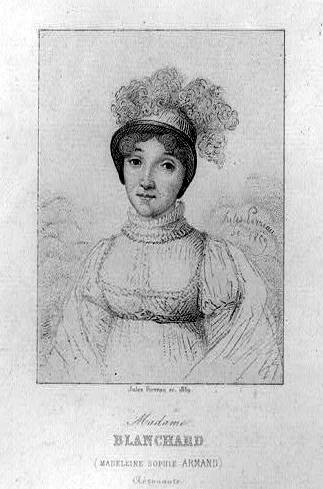 For the opening night of the opera in Frankfurt in 1810, she was allegedly responsible for a poor audience, as most of the city turned out to see her rather than attend the opera’s debut. AN UNPLANNED DESCENT In 1819, when Blanchard was 42 years old, she made an ascent over the Tivoli Gardens (now the site of the Saint-Lazare station), an area she was very familiar with. She was warned repeatedly about the dangers of using pyrotechnics in her exhibitions. She had never had an incident, but on the night of July 6, she was uncharacteristically nervous. She went ahead with the demonstration, wearing a white dress and white hat topped with ostrich feathers and waving a white flag. There was a strong wind and the balloon had difficulty rising. It bounced off a tree in the attempt. Blanchard threw ballast overboard, reducing the weight but also jeopardizing her stability. When she had cleared the trees, Blanchard began her show using “Bengal Fire” fireworks to illuminate the balloon. While she was still rising, the hydrogen caught on fire and the balloon started to fall. The wind carried her off course, and Blanchard continued to eliminate ballast to become lighter and keep from plunging to the ground. The balloon drifted above the rooftops of the Rue de Provence where the hydrogen gas finally burned up, causing the balloon to drop onto the roof of a house. Blanchard was tossed out of her small basket, fell to the street below and was killed. Speculation after the fact determined that the pyrotechnics were knocked out of position by the tree the balloon hit on the way up. The crowd was stunned, and the rest of the event was cancelled. The owners of Tivoli Gardens donated the admission fees to the support of Blanchard’s children. When they found out that she didn’t have any children, the money was used to build a memorial to her over her grave, which was engraved with epitaph “victime de son art et de son intrépidité” (“victim of her art and intrepidity”). QUESTION: How do you feel about flying? Would you like to be a pilot? Why or why not?